'A man for all seasons'? 'A man for all seasons'? 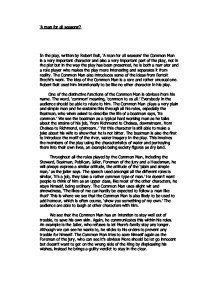 In the play, written by Robert Bolt, 'A man for all seasons' the Common Man is a very important character and also a very important part of the play, not in the plot but in the way the play has been presented, he is both a narrator and a role player who makes the play more interesting and separates it from reality. The Common Man also introduces some of the ideas from Bertolt Brecht's work. The idea of the Common Man is a rare and rather unusual one. Robert Bolt used him intentionally to be like no other character in his play. One of the distinctive functions of the Common Man is obvious from his name. The word, 'common' meaning, 'common to us all.' Everybody in the audience should be able to relate to him. The Common Man plays a very plain and simple man and he sustains this through all his roles, especially the Boatman, who when asked to describe the life of a boatman says, 'its common.' ...read more. An example is the Jailer, who refuses to let More's family stay any longer. Although we can see he wants to, he sticks to his orders to prevent any trouble for himself. The Common Man tries to save himself again as the Foreman of the jury, who can see it's obvious More should be let go innocent but doesn't want to get on the wrong side of the King by displeasing his wishes, instead he brings a guilty verdict to stay in the clear. The importance of The Common Man is the way he is able to be both inside and outside of the play, he can also bridge a gap between the play and the audience and we see him as an informer. When the audience needed to know of Wolsey's death, the Common Man throws the Cardinal's red robe and hat to the floor, indicating his death. Robert Bolt created him as a use of 'alienation,' the way in which the audience are deliberately kept separate from the play to remind them that are just watching a play. ...read more. Again he is trying to stay safe by pretending ignorance. When we think about this we can also think back to him being simple and common. The Common Man shows self-preservation at one point and a way in which he is not so simple and ordinary, when he declines the bribe, where as a simple man might have just taken the money, The Common Man understands the wrong and refuses the money. During his role as the Foreman of the Jury, The Common Man seems to bring all the roles together I think a quote that very well sums up the Common Man is when the jailer says, 'Better alive and no conscience, than dead with morals.' But I think the Common Man's most major function in the play is his part as narrator, if it wasn't for the Common Man the story would be told alone just by the characters, this could mean the story might be harder to understand as it goes along. Furthermore the story would be less interesting as well as harder to grasp. 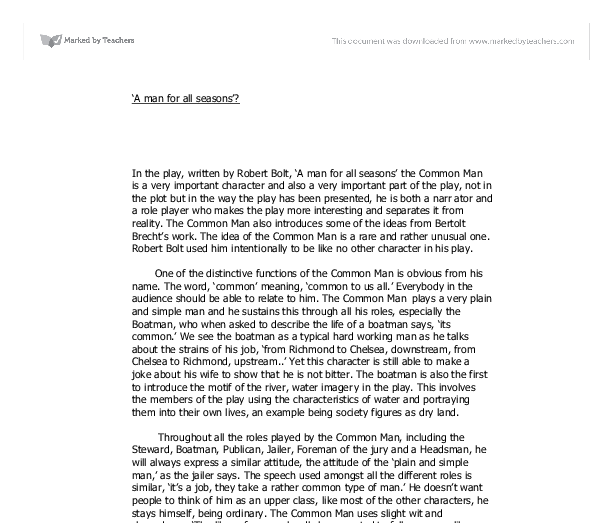 The Common Man is a very important part of the play 'A man for all seasons.' ...read more. The Significance of the Common man in &amp;quot;A man for all Season&amp;quot;. Telling the events in this order enhances the feeling of the performance only being a play, which it is making it less realistic. The Common Man uses a light-hearted chatty style, at the beginning of the play; he uses comedy in the play, which tackles some serious issues. He was extremely threatening and intimidating and appeared massively looming and dominant. He did this by mainly using his body by emphasizing but at the same time minimising his actions. Meaning that all his actions were very large and over stated, but at the same time uncomplicated and fairly few. 'Reduce Adam to the Common Man.' Adam was the first man to walk naked in the Garden of Eden; he then sinned and was cast out which represents the fall of man and in Christians' beliefs led to the development of evil. After doing little more than sending psychic signals to sensitives and cultists worldwide, great Cthulhu returns to the ocean depths, but the narrator has forever lost his peace of mind. For example, there is no word corresponding to the noun moon, but there is a verb to moon or to moondle. The moon rose over the sea would be written . . . upward, beyond the onstreaming it mooned. "The previous passage refers to the languages of the Southern hemisphere. The conventions we used in this piece were; repetition, flashback, thought tracking, fast motion, vocal collage and fantasy. We used repetition a lot as we thought it played a big part in dreams and nightmares. Repetition is where you do or say something again and again. into a few hours of theatre and the idea that it is highly unlikely that a play which was written in the late twentieth century about a political argument in the fifteenth century, five hundred years earlier, would be appealing to an audience.